Wow! Update 6 has been very interesting! ** New quests and (I believe) a new instance has been released for the “Great River”. ** Virtue traits rose to a max of 14. 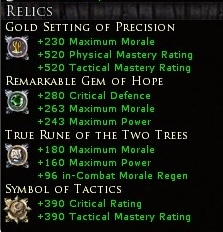 ** Relics have increased a Tier, up to Tier 8, with special relics just for level 75 LIs. Let’s start with the easy ones: Virtues and Relics. Your choice of virtues depends on who you are and where you are going. For RKs, typical virtues are Zeal, Loyalty, Confidence, Wisdom, Idealism, or Honor. I choose the first five for a good selection of morale, critical offense, and resistance, with maximum Will. If you are choosing virtues where the primary modifier and secondary modifier are not critical to your class, you need to understand what you are giving up. Update October-2012: The virtues go up to 16 now. Check it out at rohan-begins-crafting-and-virtues-at-16. I realized a while back that relics are a mystery to some and I wanted to write a post on them. I’m going to assume that you know how to find a Relic Master and basically how to slot a relic in your LI, so I will skip right to the relics themselves and compare the various options from which you could choose. Each description below is set up to show in this order: Tier 6, Tier 7, Tier 8, Extraordinary (65 special), Westfold (70 special), Great River (75 special). 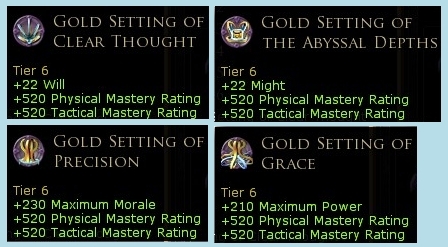 The level 65 specials have a set known as the “True” set. The True originals were designed by players. With Update 6, there are more True relics now available and I will list all of them here. You will need to think about what is important to you. I circled the ones that are important for Runekeepers and will explain some reasons why as we go along. After writing this guide, I decided to leave out a lot of the math behind what is happening. Explaining what stats modify what features needs another post. The Specials 65/70/75 for settings are shown also. Are they “special” for your build? The "of Stability" Settings give a reduction in item wear chance, bonuses to block, parry, evade, and bonuses to incoming healing. The Stability setting is for non-RKs. The "of Beginnings" Settings give Physical Mitigation (protection from damage), ICPR, and Vitality. Vitality is important, as one would guess, because it modifies all the features that help keep you alive (resistance and mitigations). The "of Endings" Settings give some ICMR, has a Critical rating, and +7.5% Devastate Magnitude. The Devastate Magnitude is interesting but know that the 7.5% is factor added onto your devastate damage. How often you hit a devastating blow is still calculated based on your “Critical” rating, which is modified by Fate. The 65 True Settings are the “True Setting of the Ages” and the "True Setting of Continuance". Like the Settings, T6/7/8 are set up in a pattern. All basic gems modify Critical rating. So with the basics, you get to choose from +Vitality, +Agility, or +Fate. The "of Faith" Gems are built for Block, Parry, and Might. Do you have a shield? If not, block has zero value for you. The "of Charity" Gems have the best Tactical Mastery of the available options. It also has Power and Tactical Mitigation. The "of Hope" Gems have good Morale, Power, and Critical Defense. Comparing the Gems as a RK, both the Charity and Hope have the same power and a smidge of some defensive protection. So, it comes down to a choice of +730 Tactical Offense or +283 Morale. The True Gems here are the “True Gem of the Circling Seas” and the "Truen Gem of the king under the mountain". If you are going for Offense from the Circling Seas, the Charity Gem is a better option. In the T6/7/8, there are patterns again. This time the options are (1) Incoming Healing and block, (2) ICMR and parry, or (3) ICPR and parry. None of these choices are very exciting for RK. 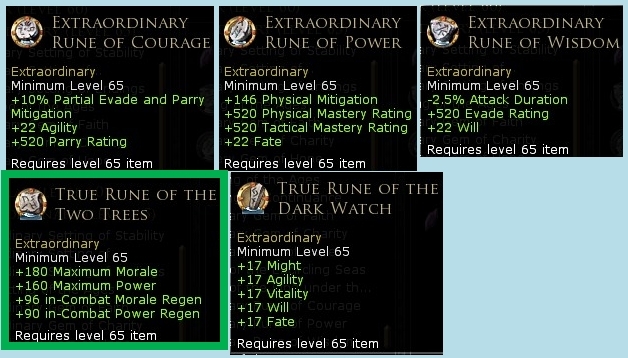 "of Courage" runes give Agility, Evade and Parry. "of Power" runes, despite the name, have nothing to do with power. They boost Fate, Physical Mitigation (defense), and Physical Mastery (useful for non-tactical classes). "of Wisdom" runes boost Will, Evade, and Attack duration. This one is a legitimate contender for a RK, although the max evade boost is ~1.5% chance to evade and the attack duration is not a modifier for inductions like I would have thought it might be (it modifies action animation time). The interesting Rune is the “True Rune of the Two Trees”, the special for 65. It gives bonuses to Morale, Power, ICMR, and ICPR. The other True Rune is the "True Rune of the Dark Watch" for those who want more overall base stats. There are now 5 levels of crafted runes. Each crafting guild can make a different type of crafted relic, depending on what you want to modify. The modifiers and their associated guild are (a) Morale – Cook, (b) Power – Scholar, (c) Vitality – Weaponsmith, (d) Will – Jeweller, (e) Fate – Tailor, (f) Agility – Woodworker, (g) Might – Metalsmith. Good to know, breaking a crafted symbol is a good way to get shards. Here is a shot of what Tailors make. The other crafts are similar with the modifications (stat, morale, power) just mentioned. 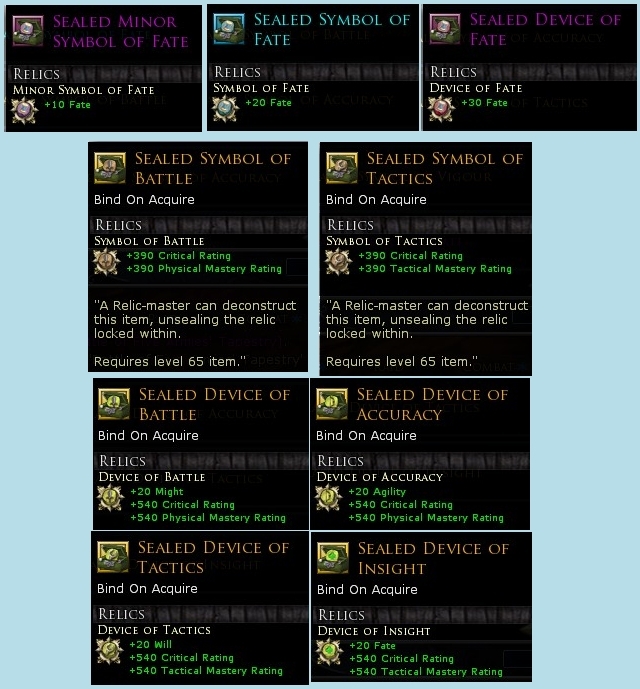 (1) Minor Symbol: The options for the first level “minor symbols” are +10 to any of the five stats, +50 morale, or +50 power. (2) Symbol: The next level of crafted relics require a Compendium volume 1, obtained in Moria (repeatable orc and dragonet slaying) or the skirmish camp (86 marks, 9 medallions). Similar to the minor symbols, these symbols come in flavors that modify +20 to any of the five stats, +100 morale, or +100 power. (3) Device: The third level of crafted symbols are new for Update 6. They are similar to the previous symbols. These devices come in flavors of +30 to any of the stats, +150 morale, or +150 power. (4) Symbol of Tactics: The fourth level of crafted symbols require a Compendium volume 2 and are not shared by outsiders. When a crafter makes one, it is bound to the crafter. The Compendium comes from Mirkwood (repeatable spider slaying) or from the skirmish camp (258 marks, 18 medallions). The crafter can trade them for one of two options: (a) +390 Critical, +390 Tactical mastery, or (b) +390 Critical +390 Physical Mastery. Need to make a specific relic? The Relic-master can help you meld any relic you want, for a price. His price is in shards. Shards are obtained randomly while breaking LIs and merging relics to higher tiers. OR, you can obtain them deliberately by breaking other relics. The greatest source for relics to break is by crafting them for the purpose of breaking them. The primary job of my entire team of lil danas when we are not at festival is the creation of relics for conversion to shards or for sale on the market (where others break them for shards). My advice is to make a plan and go for it. Without a plan, you will be in the moment wondering if that +Block and evade relic is good for you. 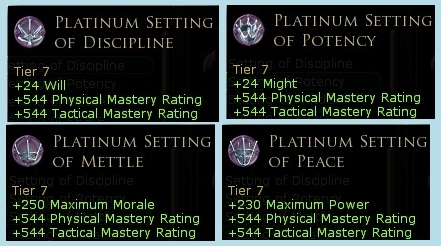 My current Relic sets for my 2 DPS and 2 Healing LIs are the same; since the modification to Tactical (offense and healing are now combined into one modifier), I don't differentiate relic needs based on when I am healing versus hitting. My current relics were fairly good for Update 5 but could use a tuneup now that Tier 8 and Great River 75 are available. 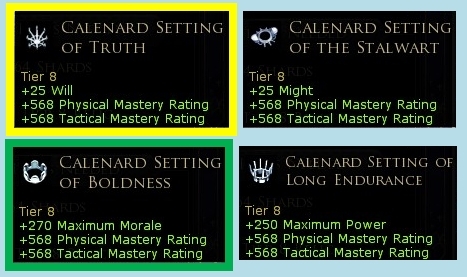 (1) I have the Tier 6 Gold Setting of Precision (for morale) and am following the same line toward the Tier 8 Calendard Setting of Boldness (similar but more). (2) I have both the Westfold Gem of Hope and Westfold Gem of Mastery. I took them both, one for the stone and one for the bag, because I liked the morale of the "Hope" and the tactical of the "Charity". I will continue along the same line toward the better gems of Hope and Mastery... the Great River Gem of Hope. (3) I have the True Rune of the Two Trees. The only other rune that is reasonable for a RK is the Westfold/Great River of Wisdom, which give Will. In my opinion, the tradeoff is not worth it, and I will keep the Two Trees (compare +180 morale, +160 power, +96 ICMR, +96 ICPR ...versus... +26 will, +584 evade, -2.5% attack duration and the cost of construction). (4) I have the crafted Symbol of Tactics (#4 above) and as soon as my cooldowns are done, I will move to the new Devices of Tactics (#5 above). I just want to give people a great opportunity to have all the information at their fingertips so that they can make good decisions. Nice. I am really glad you thought to write this up. I have been at a loss blindly slotting relics without really understanding it all. Thanks Danania. Oooooh, that is exciting! Hooray for math! This article?... geek light. I hold the really geeky stuff out of the public eyes... she says while flipping through her 3-ring binder of lotro notes and math. I often think that people like the horses and stories more, but it is undeniable that those that get the most attention are the educational ones, like this one, fastest skirmishes, the skirmish soldier, and the two on legacies. I got linked to this from one of your more recent posts. "The 'of Endings' Settings give some ICMR, has a Critical rating, and +7.5% Devastate Magnitude. The Devastate Magnitude is interesting but know that the 7.5% is factor added onto your devastate damage. How often you hit a devastating blow is still calculated based on your 'Critical' rating, which is modified by Fate." Omission does not always mean not knowing, but in case it did in this case, I just wanted to inform you that Fate also influences how hard you crit (tactically only), in addition to how often you crit (melee, ranged, or tactically). The tactical crit multiplier bonus from Fate is not stated on any tooltip, yet it exists. This has been proven in the past and also post RoI in the captain forums here: http://forums.lotro.com/showthread.php?460521-Fate-values-as-a-heal-crit-multiplier. To see for yourself, just take some fate food to a dummy and look at before/after crits.